Now in its 15th year, The Battle of Midway Roundtable is a living historical resource that includes over 70 veterans of that epic event. No Right To Win: a Continuing Dialogue with Veterans of the Battle of Midway tells their personal stories, providing unique new insight on the 20th century’s greatest naval battle. In 1942, one of the most powerful invasion forces in history descended upon the tiny atoll of Midway, 1100 miles northwest of Hawaii. The Japanese intent was to lure America’s badly depleted Pacific Fleet into the open where it would be overwhelmed, forcing the U.S. to end World War II in the Pacific on Japanese terms. But it didn’t happen that way. Through an amazing combination of skill, courage, and especially luck, the U.S. not only prevailed at Midway but delivered to the enemy a crushing defeat that instantly changed the course of the war. No Right To Win is a fresh look at the great battle, focusing entirely on first-hand accounts by Midway veterans and the understandings that can be derived from them. Included are many of their anecdotes and revelations that compel a rethinking of some of the battle’s most entrenched tenets. Could the defenders on the atoll have repulsed a Japanese amphibious assault? Did an aircraft carrier captain falsify his after-action report? Were the Japanese about to invade Hawaii? Did the battle affect the D-Day landings in Normandy two years later? Did it limit the Red Army’s westward drive across Europe in 1945? No Right To Win explores those intriguing questions and much more in a wide-ranging examination of Midway’s impact on the war in the Pacific, in Europe, and beyond. No Right To Win complements the familiar references on the Battle of Midway by providing exclusive first-person insight on the deck and cockpit-level experiences of the men who fought and won the battle. Its stars are former pilots and aerial gunners, flight deck mechanics, cruiser and destroyer sailors, communications intelligence experts, and U.S. Marines who defended the atoll. You'll find them all and more in No Right To Win . NO RIGHT TO WIN IS AVAILABLE AT BOOKSTORES AND FROM ON-LINE BOOKSELLERS. CLICK HERE FOR PURCHASE OPTIONS. 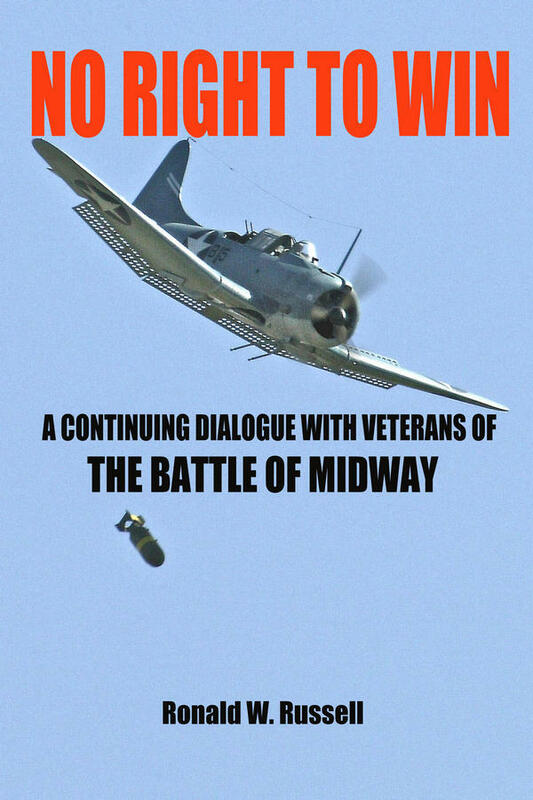 § BOMRT The Battle of Midway Roundtable: check it out now. Due to restrictions imposed by the publisher, the images included in No Right to Win were somewhat limited. To compensate for that, a large collection of photos and updated text is posted here for the convenience of everyone who has the book. Click here for the Updates page. If anyone has difficulty opening or downloading any of the files due to a slow Internet connection, they can be ordered on a CD — Contact the author for ordering information.